Street Fighter Lingerie? That’s A Start! I’ve been saying for a little while now that I want gaming and anime-related clothing to be more of a normal thing you see in your average clothing stores. Whether it’s graphic tees, dresses, hats, swimwear and yes of course underwear, I want to see all of these things become something you see not just in niche stores like Hot Topic and on various niche websites, I want to see more well-known clothing stores to carry their own lines of nerdy-themed stuff. And while this isn’t quite what I’m looking for, anything that adds onto the amount of choices consumers have to buy nerd gear, I’m all for it. Though granted this one’s quite…interesting? Street Fighter underwear, folks! Specifically, Chun-Li and Cammy underwear. Now while the Chun-Li set definitely matches, the Cammy one’s a bit odd, don’t you think? I mean…it’s not a one-piece. Why isn’t it a one-piece?! I mean to be fair, if I was going to make anything Cammy-related, it probably makes more sense to make a one-piece swimsuit rather than underwear, but hey what do I care? At the end of the day, it’s more stuff that in this case, girls can buy and wear. The sets are being produced and sold by a Japanese company called SuperGroupies (perfect name!) and they produce a lot of anime and gaming-related gear. This is just another round of stuff in their underwear collection, but this is arguably the first one to really take a stab at a major franchise (not that I can tell with any of the others sets they sell. I also can’t read Japanese…) like Street Fighter. All in all, they look good, but I personally think the skirt was a weird choice, could’ve gone the boyshorts route with Chun-Li’s set and like I said earlier, Cammy’s is off considering her character. But on the models? They look fantastic. I just want to see more stuff like this and going beyond just Japanese boutique stuff, I want to see Western markets take a shot at these things as well. It doesn’t have to be over-the-top and it doesn’t have to hit your over the head repeatedly with logos a’plenty on the clothes as if they’re trying to scream “WE’RE A POP CULTURE REFERENCE!! !” over and over again. 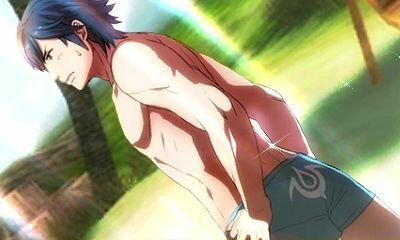 I always go back to the example of Chrom’s swimsuit as it doesn’t look obvious that it’s meant to be from something, it looks like if anything, it’s boutique swimwear where the company REALLY likes their logo. So when it comes to underwear for example, let’s try not to be too flashy. You can have Sailor Moon underwear without having a giant bow in the middle, you can have Batman underwear without a hundred logos on it, you can have Zelda underwear without having a giant triforce over the crotch. Let’s figure it out, folks! Because as soon as we do, there’s going to be a market ready for it, especially if it’s not ridiculously overpriced, as admittedly these Street Fighter sets are, priced at around $70 (Cammy) and $80 (Chun-Li) respectively. But then again, women’s underwear is stupidly expensive, so maybe that’s either the right price or just a little cheaper? I don’t know, you tell me, ladies! So yeah, more of this please! I need some Mass Effect N7 boxers and some Overwatch Soldier 76 briefs. Get on it!